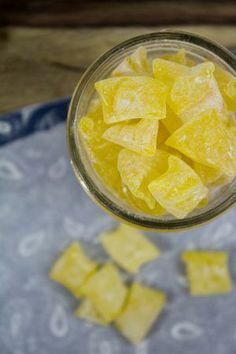 I love Lemon candy : Today in honor of Sour candy day we are making Lemon drops. Place parchment paper on small baking sheet . Place sugar, corn syrup, and water into a saucepan. Bring to soft boil, stirring constantly. Place candy thermometer into saucepan. Do not stir anymore at this point. Once it reaches 310 degrees, remove from heat. Allow the mix to sit for 30 seconds-1 minute. Place a couple of drops of coloring, flavoring, and citric acid and stir. Pour into parchment-lined pan. Let it cool briefly for 4 minutes (you want the candy harden a little but still soft so you can cut through it). Using kitchen scissors, cut into desired shapes. Dust with powdered or fine-textured sugar (this keeps from the candy from sticking together).